Bailly, R.; Carreras, X.; Luque, F. M.; Quattoni, A.J. We derive a spectral method for unsupervised learning of Weighted Context Free Grammars. 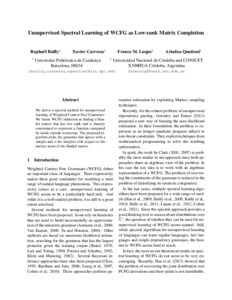 We frame WCFG induction as finding a Hankel matrix that has low rank and is linearly constrained to represent a function computed by inside-outside recursions. The proposed algorithm picks the grammar that agrees with a sample and is the simplest with respect to the nuclear norm of the Hankel matrix. We derive a spectral method for unsupervised learning ofWeighted Context Free Grammars. We frame WCFG induction as finding a Hankel matrix that has low rank and is linearly constrained to represent a function computed by inside-outside recursions. The proposed algorithm picks the grammar that agrees with a sample and is the simplest with respect to the nuclear norm of the Hankel matrix. Bailly, R. [et al.]. Unsupervised spectral learning of WCFG as low-rank matrix completion. A: Conference on Empirical Methods in Natural Language Processing. "Proceedings of the 2013 Conference on Empirical Methods in Natural Language Processing". Seattle: Association for Computational Linguistics, 2013, p. 624-635.